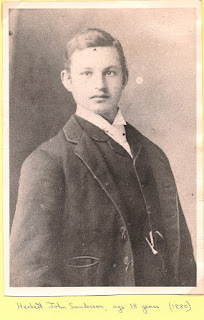 Herbert John Sanderson, one of my maternal great grandfathers, worked his entire life on the railroad in England and, according to the family story, upon his retirement brought his whole family with him to Canada. (Note that he emigrated at the age of fifty, which seems to be fifteen years before the retirement age in Britain at the time). He was born in Wisbech Fen, Wisbech St. Mary, Cambridgeshire, England on May 22, 1872 to Mark Sanderson and Phoebe Johnson Sanderson. (The photo above is courtesy of Shirley M. of the U.K., and I am indebted to her and Ann S., also of the U.K., for their many contributions to my knowledge of the Sanderson family). His ancestors originally had the surname of "Sanders" and were from Gretton, Northamptonshire. He was the third of a family of eight children, his siblings being William James, Benjamin, Mark, Charles Walter, Abraham, Alice Maud, and George Henry. He was baptised the year of his birth in the Wisbech Primitive Methodist Chapel in Wisbech St. Mary. In the first quarter of 1901, he married Phoebe Green, born October 15, 1876 in March, Cambridgeshire. He is working that year as a railway goods porter, and by 1911, he is a “railway horse shunter” for the Great Eastern Railway. Phoebe was the daughter of Joseph Green and Phoebe Lefevre Green. She was descended on her mother's side from French Huguenots who settled in the Thorney area of Cambridgeshire in the 17th Century. Herbert and Phoebe had five children, William, Tom, Bert, Olive and Leonard Charles. All were born in March, Cambridgeshire. In 1911, the family is living in South Lynn, Norfolk, and in 1922 they are living in Broxbourne, Hertfordshire. The eldest son, William, my grandfather, lists his occupation as “chauffeur” in that year. This is consistent with his own report of having worked on an “estate” before coming to Canada. He also said that his first job was working in a “munitions factory” during W.W.1. The family story is that Herbert had always dreamed of being a cowboy, and so when he retired from the railroad, he brought his wife and all of his children to Canada with him to fulfill his dream. Apparently, he was able to make his dream come true when he worked as a cowboy in the B.C. Interior for a time. There is also a report that the move may have had something to do with his wanting to preserve his marriage. The family left England on May 18, 1922 from Southhampton on the Empress of Scotland, and arrived in Quebec on May 22nd, Herbert’s fiftieth birthday. All of the family members state that their aim is to do farming, and that their destination is “Saskatchewan”, with no particular address in mind. On board with them, is Herbert’s nephew, George Henry Sanderson, son of his brother, Charles Walter Sanderson. He is eighteen years old and his prospective employer, a Mr. Stanley Day, a farmer in Craven, Saskatchewan, has paid for his passage. (I found a brief biography of Stanley in a local history book, From Buffalo Grass to Wheat: A History of the Long Lake Distrct, http://www.ourroots.ca/e/page.aspx?id=580259). Since Herbert and his family described their destination as “Saskatchewan”, it is not inconceivable that they accompanied George to Craven. George had only ten pounds in his pocket, and returned to England shortly thereafter. (There is a Herbert Sanderson and a George Henry Sanderson who filed land claims in Saskatchewan, but it is not certain if they apply to this family). The family story is that the Sandersons worked their way across Canada from 1922 until 1926 when they moved to Vancouver, British Columbia. Herbert appears in a 1926 Vancouver city directory, and in the directories for every year thereafter until his death. His occupation is listed as “labourer” and “floor layer” in these directories. He is living at a variety of addresses. His son William is living with him until 1928, when he is there with his new wife, Alice. Herbert died February 5, 1937 at the age of sixty-four in Vancouver of “uremia, chronic nephritis, and arteriosclerosis”. He is buried in the Mountain View Cemetery on Fraser Street in Vancouver with his wife, Phoebe. Phoebe died of a stroke at the age of 69 on June 3, 1946, the same year that the other Phoebe Sanderson, her mother-in-law, died at the age of 99 in England. 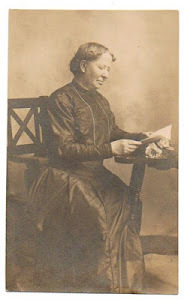 Phoebe, Herbert's wife, had been living with her son, Tom, the last two years of her life in Vancouver. Herbert is remembered by his granddaughter, my mother, as a "good grandfather". Phoebe is remembered as loving to play cards, and for teaching her grandchildren to play.